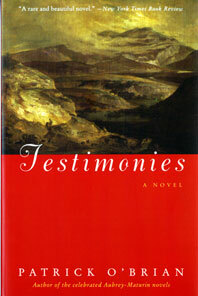 Delmore Schwartz, the most influential critic in postwar America, wrote of Patrick O'Brian's first novel Testimonies: "A triumph...drawn forward by lyric eloquence and the story's fascination, [the reader] discovers in the end that he has encountered in a new way the sphinx and the riddle of existence itself." Schwartz' imagination was fired by this sinister tale of love and death set in Wales, a timeless story with echoes of Thomas Hardy and Mary Webb. Joseph Pugh, sick of Oxford and of teaching, decides to take some time off to live in a wild and beautiful Welsh farm valley. There he falls physically ill and is nursed back to health by Bronwen Vaughn, the wife of a neighboring farmer. Slowly, unwillingly, Bronwen and Pugh fall in love;' and while that word is never spoken between them, their story is as passionate and as tragic as that of Vronsky and Anna Karenina.